Note : Muffasal Surahs mean - The last seventh of the Qur'aan, beginning with soorah Qaaf (no. 50) according to the soundest view, as before. 1 - He (sallallaahu 'alaihi wa sallam) used to recite the longer mufassal184 surahs185, hence "he (sometimes) recited al-Waaqi'ah (56:96) and similar surahs in two rak'ahs"186. 7- Sometimes he used to recite more than that: "he would recite sixty aayaat or more"194 - one of the narrators said, "I do not know whether this was in each rak'ah or in total." 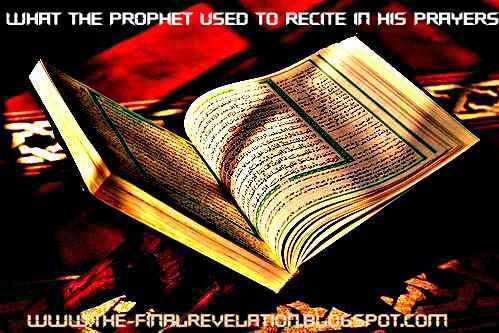 8- He used to recite soorah ar-Room (30:60)195 and sometimes soorah Yaa Sin (36:83)196. Recitation of Aayaat after al-Faatihah in the last two Rak'ahs"
5- He used to recite the surahs mentioned under "Zuhr prayer" above. See the above mentioned link to see ahadeeth wherein rasool (s.a.w) did pray 2 rak'ah nafil prayer after Al witr. 184 The last seventh of the Qur'aan, beginning with soorah Qaaf (no. 50) according to the soundest view, as before. 185 Nasaa'i & Ahmad with a saheeh isnaad. 186 Ahmad, Ibn Khuzaimah (1/69/1) & Haakim who declared it saheeh and Dhahabi agreeed. 188 Muslim & Tirmidhi. It is given along with the next one in Irwaa' (345). 189 Muslim & Abu Daawood. 190 Abu Daawood & Baihaqi with a saheeh isnaad. And what is apparent is that he (`alaihis salaam) did it on purpose to establish its validity. 191 Abu Daawood, Ibn Khuzaimah (1/76/1), Ibn Bushraan in al-Amaali & Ibn Abi Shaibah (12/176/1); Haakim declared it saheeh and Dhahabi agreed. 192 lit. "the two by means of which refuge is sought", i.e. the last two surahs of the Qur'aan, both beginning "Say: I seek refuge ... "
193 Abu Daawood & Ahmad with a saheeh isnaad. 195 Nasaa'i, Ahmad & Bazzaar with a good isnaad. 196 Ahmad with a saheeh isnaad. 197 Moosaa is mentioned in aayah 45: "Then We sent Moosaa and his brother Haaroon, with our signs and manifest authority. ;" `Isa is mentioned soon after in aayah 50: "And We made the son of Maryam and his mother as a sign - we gave them both shelter on high ground, affording rest and security and furnished with springs. " 198 Muslim, & Bukhaari in ta`leeq.form. It is given in Irwaa' (397). 199 Ahmad & Abu Ya`laa in their musnads, and Maqdisi in al-Mukhtaarah. 202 Ahmad with a saheeh isnaad. 204 Muslim, Ibn Khuzaimah & Haakim. 205 Muslim & Abu Daawood. 207 Ibn Maajah & Ibn Khuzaimah. 208 Tahaawi, Ibn Hibbaan in his saheeh & Ibn Bushraan; Ibn Haajar declared it hasan in al-Ahaadeeth al-`Aaliyaat (no. 16). 210 Muslim, & Bukhaari in Juz' al-Qiraa'ah (Article on Recitation). 211 Abu Daawood with a saheeh isnaad & Ibn Khuzaimah (1/165/1). 213 Abu Daawood, Tirmidhee& Ibn Khuzaimah (1/67/2); the latter two declared it saheeh. 214 Ibn Khuzaimah in his saheeh (1/67/2). 215 Bukhaari & Abu Daawood. 217 Bukhaari & Muslim (452). 218 Ibn Khuzaimah in his saheeh (1/67/2) & Diyaa' al-Maqdisi in al-Mukhtaarah with a saheeh isnaad. 219 Bukhaari in Article on Recitation & Tirmidhi, who declared it saheeh. 223 Abu Daawood with a saheeh isnaad & Ibn Khuzaimah. 227 ibid (Bukhaari & Muslim). 228 Nasaa'i & Ahmad with a saheeh isnaad. 229 Tayaalisi & Ahmad with a saheeh isnaad. 230 Ibn Khuzaimah (1/166/2), Tabaraani & Maqdisi with a saheeh isnaad. 231 Bukhaari 3050 & Muslim. 233 called "at-toolayain": A`raaf (7) is agreed to be one; An`aam (6) is the other, according to the most correct saying, as in Fath al-Baari. 234 Bukhaari, Abu Daawood, Ibn Khuzaimah (1/68/1), Ahmad, Siraaj & Mukhlis. 235 Tabaraani in Mu`jam al-Kabeer with a saheeh isnaad. 236 Ahmad, Maqdisi, Nasaa'ee Ibn Nasr & Tabaraani . 237 Nasaa'i & Ahmad with a saheeh isnaad. 238 Ahmad & Tirmidhi, who declared it hasan. 239 Bukhaari, Muslim & Nasaai. 244 The narration is like this, with Nisaa' (4) before aal-`Imraan (3), and thus it is evidence for (the permissibility of) departing from the order of surahs found in the `Uthmaani copy of the Qur'aan in recitation. An example of this has already been seen. 245 Muslim & Nasaa'i . 246 Abu Ya`laa & Haakim, who declared it saheeh and Dhahabi agreed. Ibn al-Atheer says: "... the Seven Long surahs are Baqarah (2), aal-`Imraan (3), Nisaa' (4), Maa'idah (5), An`aam (6), A`raaf (7) and Tawbah (9)." 247 Abu Daawood & Nasaa'i with a saheeh isnaad. 248 Muslim & Abu Daawood. 250 Nasaa'i & Tirmidhi, who declared it saheeh. 252 Daarimi & Sa`eed ibn Mansoor in his sunan with a saheeh isnaad. 253 Ahmad with a saheeh isnaad. 254 Daarimi & Tirmidhi, who declared it saheeh. "This is the zeal/fervour of the Muslims in their actions which bring them nearer to their Lord. However they are bound to fall short and leave some actions (which they began due to this zeal) so the most beloved of their actions to Allaah's Messenger (sallallaahu `alaihi wa sallam) were those done otherwise (and kept up), so he ordered them to carry out righteous deeds which they are able to do continually and keep to until they meet their Lord-the Mighty and Majestic. It is narrated from him (sallallaahu `alaihi wa sallam) to clarify this that he said: "The actions most loved by Allaah are those which are the most regular, even if they are little." I say: this hadeeth which he prefixes with the words "it is narrated" is saheeh, agreed upon by Bukhaari & Muslim from the narration of `Aa'ishah (Allaah be pleased with her). 256 Ar. fatrah: interval, break, lapse; referring here to a period of reduced enthusiasm. 257 Ahmad & Ibn Hibbaan in his saheeh. 258 Ibn Sa`ad (1/376) & Abu ash-Shaikh in `Akhlaaq Nabi (281). 259 Daarimi & Haakim , who declared it saheeh and Dhahabi agreed. 261 Ahmad & Ibn Nasr with a saheeh isnaad. 262 Bukhaari & Abu Daawood. 263 Ahmad & Abu Daawood with a saheeh isnaad. 265 Nasaa'i, Ahmad & Tabaraani (1/187/2); Tirmidhi declared it saheeh. 266 Nasaa'i, Ibn Khuzaimah (1/70/1), Ahmad, Ibn Nasr & Haakim, who declared it saheeh and Dhahabi agreed. 267 Ahmad & Bukhaari . 268 Nasaa'i & Haakim, who declared it saheeh. 269 Tirmidhi, Abul `Abbaas al-Asamm in his al-Hadeeth (vol 2 no. 117) & Haakim, who declared it saheeh and Dhahabi agreed. 270 Nasaa'i & Ahmad with a saheeh isnaad. 271 The evidence for these two rak`ahs is found in Saheeh Muslim and others as a practice of the Prophet (sallallaahu `alaihi wa sallam), but they oppose his saying: Make the last of your prayer at night odd (witr) transmitted by Bukhaari and Muslim. The scholars have differed in reconciling these two hadeeth, none of them being convincing to me, so the most cautious thing is to leave the two rak`ahs in compliance with the command of the Prophet (sallallaahu `alaihi wa sallam). Allaah knows best. Later I came across an authentic hadeeth which had a command for two rak`ahs after witr, so the order of the Prophet (sallallaahu `alaihi wa sallam) agrees with his action, and the two rak`ahs are validated for everyone; the first command is thus one of recommendation, not negating the two rak`ahs. The latter hadeeth is given in Silsilat al-ahaadeeth as-saheehah(1993) - see Appendix 7. 272 Ahmad & Ibn Nasr and Tahaawi (1/202) and Ibn Khuzaimah & Ibn Hibbaan with a hasan saheeh isnaad. 273 Muslim & Abu Daawood. It is given in Irwaa' (345). 275 Muslim & Abu Daawood. 278 This is the saying of Imaam Shaafi`i, Ahmad and Ishaaq, and some of the later Hanafis who researched took this view. As for the recitation of a soorah after it, this is the view of some of the Shaafi`ees and it is the correct view. 279 Bukhaari , Abu Daawood, Nasaa'i & Ibn al-Jaarood. The addition is not shaadhdh (odd) as Tuwaijiri thinks. 280 Nasaa'i & Tahaawi with a saheeh isnaad. 1Ibn al-Mubaarak in az-Zuhd (162/1 from al-Kawaakib 575), Abu Daawood & Ahmad with a saheeh isnaad.